A nationally recognized leader in innovations in health care, Jonathan “Jack” Lord, M.D., became the University of Miami’s Chief Innovation Officer when he returned to his alma mater after three decades in leadership roles that spanned the healthcare spectrum in September 2011. In March 2012, he was named Chief Operating Officer of the Miller School of Medicine and UHealth-University of Miami Health System. He completed a financial turnaround of the Miller School and continues as a Professor of Pathology. A board-certified forensic pathologist who began his medical career in the U.S. Navy and later served as chief operating officer of the American Hospital Association and several biotech companies, Lord was the former chief innovation officer and senior vice president of Humana. During his time at Humana, he created Humana’s Innovation Center, which combines research, technology and consumer experience to promote health and well-being. He also contributed to the field of predictive sciences by using advanced analytics to predict who will become ill in the future and how to prevent disease. Further cementing his ties to UM, he oversaw the creation of the UM/Humana Health Resources Center on the Miller School campus in 2006. Lord also serves or has served as a member of a number of prestigious boards and organizations, including the Centers for Disease Control and Prevention’s Advisory Committee to the Director; the National Advisory Council for Healthcare Research and Quality, which advises the U.S. Secretary of Health and Human Services; and the Joint Commission on Accreditation of Health Care Organizations. He was a member of the President’s Council at UM, an advisory group of some of the University’s most prominent alumni. His previous academic appointments include Dartmouth Medical School, George Washington University and the Eastern Virginia School of Medicine. 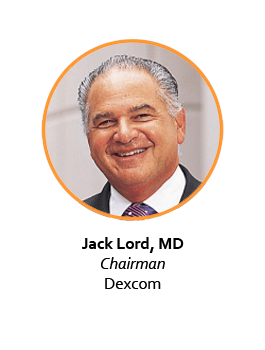 Dr. Lord serves as the Chair of the Board of Directors of Dexcom, is a Director at Stericycle, and serves on advisory board roles for Serco PLC (UK), Anthelio Health and Third Rock Ventures. He has earned certificates in Governance and Audit from the Harvard Business School.